Honor, it is a word that has existed for as long as history. What do you think of when you think of honor? Do you think of medieval knights? Soldiers? Police officers? Perhaps firemen? I know we certainly don’t think of politicians. According to the ever handy dictionary.com, honor means honesty, fairness, and integrity, to be held in high respect. Honor is a word we use to describe people of greatness, people who held fast to their beliefs and acted with honesty, and integrity. This could apply to a great many people you know, and I truly hope it does. This weekend, a simple disagreement about another’s actions sparked a deep turmoil for me, and I began to question honor in today’s world. I was suddenly thrust into deep thought about the ability to ask for help, deception, and pride. It may seem a bit muddled, but I will do my best to explain. My words may seem a bit controversial, because it truth they are. Besides, it just wouldn’t be a Monday without a bit of controversy now would it? To begin this explanation, I should tell you a little about where I am from. I was born and raised in the suburbs of Boston, Massachusetts. Massachusetts is considered one of the more expensive states overall to live in. In fact some of you may have heard its nickname, Taxachusetts. Especially with the recent economy, there are many that struggle to continue living here simply because the cost. To help this struggle, the State offers programs to assist those in need. Although there is much negativity towards the Welfare program, WIC, (Women, Infants, and Children) or the Food Stamps (SNAPS) program, I am a firm believer that they are necessary and wonderful programs. I myself have had the need of WIC aid at one time. People will do what they must to survive, and there is no shame in asking for help. These programs were put in place to help struggling families, and there is nothing wrong in accepting it. I have had many friends call upon these programs to help get back on their feet. I have never once looked down upon them, or scorned them for it. In fact, I never really gave it much thought. That was until this weekend when a simple discussion brought about a sharp sense of anger. There is a very big difference between needing these programs, and wanting them. When I applied for financial aid this year, as I am returning to school in September to pursue writing, I did not receive any. Instead, the government has graciously allowed me to borrow the necessary funds. I was prepared for this, as my family and I are in a good position financially. It did not damper my spirits in the slightest. I know that many people can receive aid, but I truly believe it should be granted to those that need it. Although I would love to have it, I know I do not fit the bill. What upset me so much this weekend was deception, that is to say people who lie to get benefits they may or may not deserve. Those that live in the United States know that this is a hot topic. Much of this hatred is aimed at those receiving unemployment without looking for a job, but that is not what this post is directed at. This is directed at those that receive benefits, and lie about why they need them. Take a person who receives assistance because they are deemed eligible. That person receives a free education, usually to a school of their choice pending their merits, cash assistance, healthcare assistance, food assistance, even housing assistance. To all, it seems like they are getting all the help they need to get back on their feet. Except what they don’t tell the government is that they are working under the table making a good $500 to $600 plus a week. It may not seem like much money, but that is a good amount over minimum wage, and that wage alone would disqualify them from most of the assistance they receive, pending the size of their family of course. So imagine the frustration of those that go to their job, day in and day out, have 30% of their wages taken out in taxes, and receive less take home pay than the other person who is also receiving all the assistance, paid for by those very same tax dollars. It is very discouraging. Despite that, I can see why people abuse the system. It is truly financially a better option. It is not, however, an honorable option. So I ask then, is it worth it? Is it wrong, or is it right? Anyone who claims that is right is deluded. And yet history teaches us that just because something is not right, does not mean that people are not going to do it. After all, if they can qualify for it, they will go ahead and take it. This is where my thoughts on pride surfaced. As stated before, there is nothing wrong with taking help when you need it. Key word there is need. When I first had my daughter, my fiancé and I struggled. I was out of work due to the harsh pregnancy, and my fiancé was the only one brining in money. We struggled to pay bills, and we decided we needed help. Luckily we were able to join a wonderful program called WIC which helps families by supplying basic things such as fruits and vegetables, milk, and even formula to those who need it. We joined WIC for a few months, but when we got back on our feet we decided we no longer needed it and stopped the program. It had served its purpose and we moved on. Now, we are in a great situation due to hard work, and a drive to do better for our family. I went out, found a fantastic job and am now supporting my family to the best of my ability. I am proud to say that. I am also proud to say that I am doing it on my own. I have no ill thoughts to those that need help because they are doing what they need to do for their families, and that is something to be just as proud of. However, I would not be proud to deceive these programs, and cheat the system to get benefits you are not entitled to. It may not be ideal that these things are not available to everyone, but then if that were the case our taxes would skyrocket and then this post would be about that. So to those people who are abusing the system to your own advantage, I ask a simple question. Does it make you feel proud that you are able to get benefits you might not deserve? If it does, well then all the power to you. While you stand proudly over your pile of deception, I will stand proudly over my accomplishments. And should the government catch you, which in all honesty is doubtful, then you might want to Google the definition of fraud. Many of you have probably heard a lot of talk about parents using television to “babysit” their children. If you are trying to get something done, you turn on the TV, park your children in front of it and voila, instant babysitter. Some parents embrace this, some do not. Some studies say that it is very bad for your child; others say that depending on the program it can go good for your child. Many of the discussions I have heard on the subject generally tend to align with the first. It goes hand in hand with video games consuming our children’s lives, increasing child obesity, antisocial behaviors, and laziness. Now to be honest, I have mixed reviews about this. I am a very technology centered person, as is my fiancé. My daughter, despite being only two, can easily work my iPhone like a pro. She knows which remote goes to what, and she knows that the keyboard and mouse only work if the computer is on. She is already following in our technology savvy footsteps. Some parents would look at us and sneer that my child knows the opening song to a few programs, mainly Mickey Mouse Clubhouse. To those parents, I say mind your own business. My child watches TV, but she also spends a good portion of her day outside playing in the sun, and she has the tan lines to prove it! Yes, she knows a lot of the opening songs of the shows she loves, but that is also because we sing them all the time! As for knowing how to use my iPhone and tablet, well all I have to say is that when she goes to school and needs to know how to use things like that, she can tutor your kid who can’t. 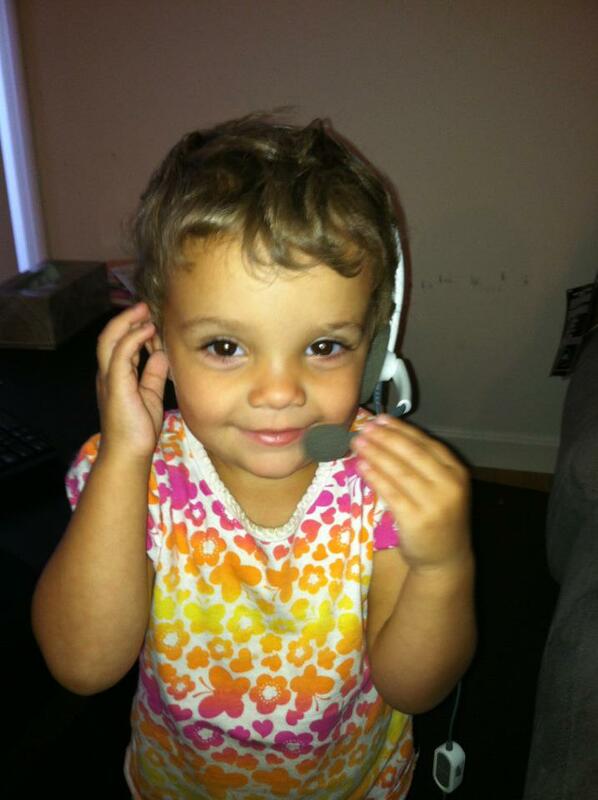 Kayla wearing her Daddy’s gaming headset! I actually had a slight confrontation about electronics and children with a coworker. He is kind of earthy and I was showing a picture of my daughter wearing my fiancé’s gaming headset to another coworker when he said, rudely I might add, (this is a true quote, by the way) “Wow your daughter is already playing video games. You better be careful or she will end up as one of those teenagers with acne and no social life.” Seriously? Hi, this is my iPhone and it wants to punch you in the face. First of all, gaming doesn’t cause acne. I am positive of that. Do you see a warning sign on the gaming console saying Warning: Use of this product will cause acne, make you fat, and destroy any hope at having friends. No, I am pretty sure it doesn’t. Second, obviously I don’t to let her sit all day in front of the TV all, can’t you see the tan on that child? It isn’t good for her, and it’s not good for my electric bill either. And third, mind you own business! Why do people have such a condescending attitude about involving electronics into a child’s daily routine? You can easily turn any game, or television show into a special bonding moment. For example, I have a wonderful app on my tablet that works with my daughter on her colors and her shapes. She adores this game. We sit down together on the couch and play together. She laughs, I laugh, and she is learning. As for television? Well my daughter has a lot of energy at night for some reason. So, to help her wind down we turn on the TV and cuddle on the couch. We call this our Cuddle Time. She curls up next to me with her teddy bear and her blanket and we watch a movie. Gosh I am such a bad parent! Now I understand that some people take electronics to the extreme. There are some people who let their children park it in front the TV or computer all day and never move. Yes this is bad, I get it.However I also feelthis is just as bad as filling every waking moment of your child’s life with some sort of educational activity, electronics or not. Anything to the extreme can be detrimental to your child’s development, and health. The key is to use a healthy mix. Instead of using the TV as a babysitter, perhaps involve them in what you are doing. My daughter loves to empty the dishwasher. I just have her hand me the stuff as I put them away. You don’t always need to distract them if you are trying to get something done. Instead, use TV in a meaningful way to enhance their day. Make it an after supper exclusive, or a lure to get up early in the morning. You guys are smart, you will think of something. Just stop sneering at those of us who do. The point of this blog is that you shouldn’t feel bad about putting on the TV for your children, just as you shouldn’t feel bad about turning it off and pushing them outside to get some nice vitamin D. It’s all about the mix. Less is more, or is it? med a little startling. If possible the tiny slips of material known as bikinis had shrunken. Now I will admit I was an avid bikini clad young adult until I got a little thicker, but my bikinis and these bikinis are miles apart. I have always been the more conservative type, generally staying away from showing too much midriff or too much cleavage. 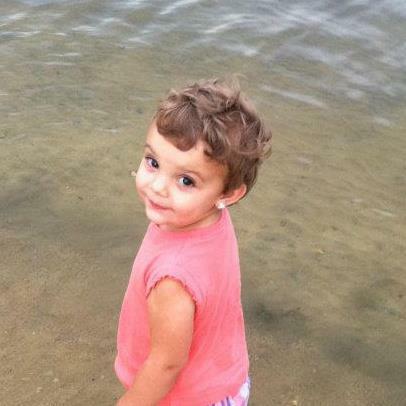 Even before I had my daughter, I had always dressed in clothing that did not reveal too much. It had nothing to do with my body type, because I had been thin in my younger years. It was merely something I simply did. I most certainly did not dress in tarps to cover my body, and I still managed to earn a few disapproving glances from the much older generation, yet I always stayed firmly behind that line marked conservative. This was simply my choice, and I had no ill thoughts toward some of my more risqué friends. However what I thought was risqué back then, is starting to look more conservative today. Now, in fear of sounding like an old woman, I have to ask is less truly more? I know when it comes to makeup, it is a common statement that less make up is better, but what about clothing? I suppose I was always brought up on the quip “Leave a little to the imagination.” That statement, it would seem, is a fading belief. It is not that I have something against revealing clothing, in fact It does not faze me too much, to a point. After that line, that point, I find it somewhat off-putting. The reason for these thoughts came in the form of two teenage girls, probably in the mid years of high school. They were wearing string bikinis, however these are not the string bikini’s I remember. The bottoms seemed to be somewhere between a regular bikini cut, and a thong. The tiny triangle top seemed to cover a mere 10% of the breast, and that is estimating high; really high. Am I aging myself by voicing these thoughts? I know our grandparents always chastised us for our audacious fashion sense, but isn’t there a line at some point? Twenty years from now will we all be walking around naked? Perhaps my point seems a little moot considering this was at a beach. Bathing suits have always been a little more revealing. Still, I cannot help but wonder if there really is a line to be crossed. I know we roll our eyes are our parents and grandparents tsking as we walk around without nylons, but is this something different? Don’t get me wrong, I am not saying that we should all be walking around in below-the-knee skirts and shirts that go to the top of the collarbone, but the opposite extreme seems just as inappropriate, especially on young adults. Or on kids for that matter! String bikinis for toddlers? Really? I won’t even get started on that topic. Back to my original question; Is less truly more? Is there a happy medium between too much and too little? I know more conservative things are starting to come “back in fashion” however they don’t seem to be catching on in the younger crowd. Does it make me old fashioned to not desire to see the curves of a teenager’s behind because her daisy dukes do not cover the entire cheek? What do you think?